Here’s my W. H. Dimond SIB in progress. 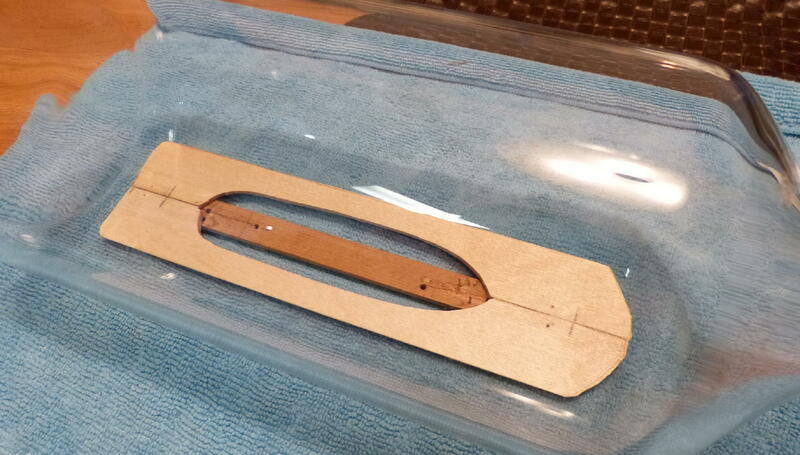 The hull is 4-3/4” long 1-1/8” wide and in two sections. It will go into a bottle that has a neck opening of 1-1/16”. 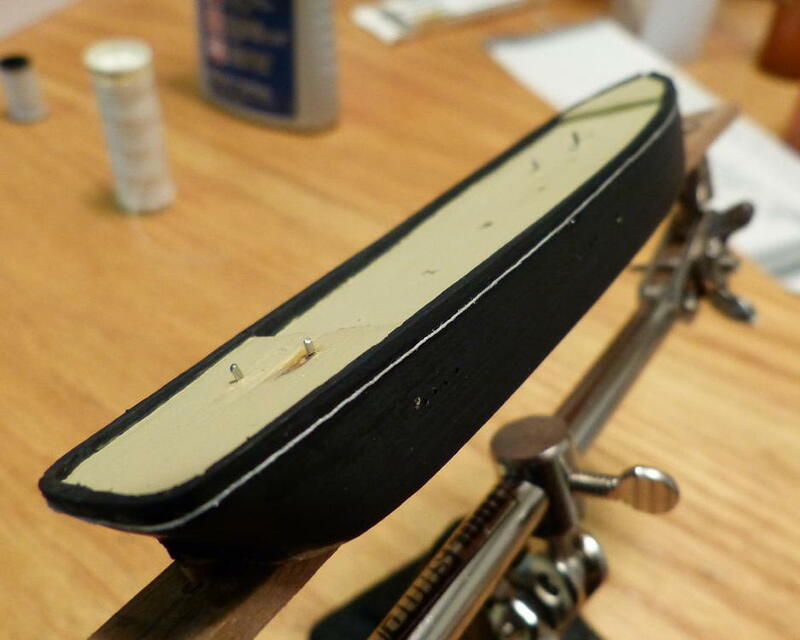 To secure the ship to the bottle, the hull will be glued to a wood strip base and this strip will be glued to the bottle using silicone. This is going to be my method of inserting the two-section hull inside the bottle: attach one hull half to the base and then place it inside the bottle only just past the neck. The other half of the hull will then be added. The halves have short pegs for alignment. 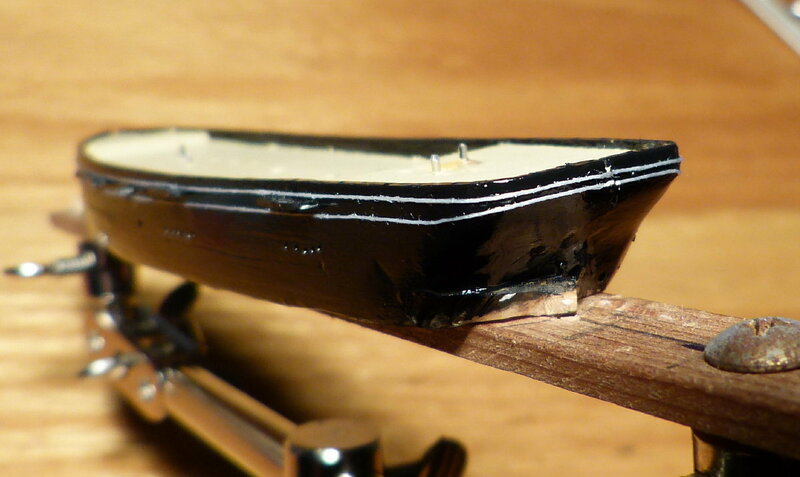 The lines for the rigging will come out below the bow where there’s a groove carved in the base strip. All this is because I want to keep track of and avoid pinching these lines. The three masts are pegged. They will go in one at a time, back to front, of course. I made a tool that holds the mast horizontally for passing through the neck then rotates vertically. Then after the mast is guided into its hole, the grip on the mast is released. Intrigued? I’ll post some photos showing how this works shortly. I'm very intrigued about your mast tool. That sounds very interesting. I'm also interested in how you do the rigging. Inserting the masts one by one isn't something I have a lot of experience with. I think leaving the sails off is a great idea especially for a first ship. From old ships in bottles I've seen the earliest common ones in the late 19th century (Giovani Biondo bottles being an acception) didn't have sails. They became more widely used in the early 20th century around around 1915ish. There really is a beauty to rigging and leaving the sails off can bring that out. Great work so far. I'd like to see that tool too! Thank you, all, for the encouragement! I just posted the mast tool in another thread titled "mast handling tool". DSeimens, I'm giving and have given a *lot* of thought on how to put this all together. It exercises the mind, doesn't it? 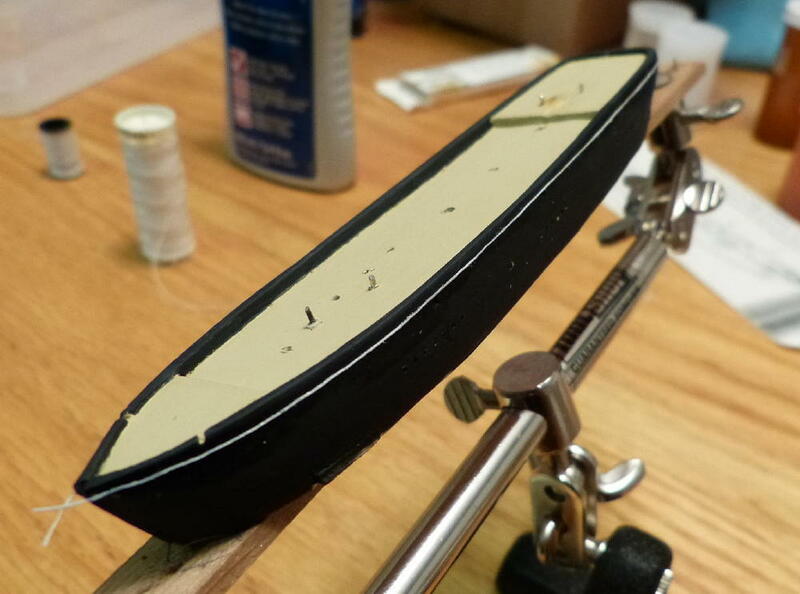 Just for discussion, I'm putting individual shroud lines in, considering the usual practice of tightening them through the plates (pardon my lack of proper terminology) on the hull sides and out the bottom of the hull. A lot of threads going on there. An idea: how's about securing them at the hull first and do the tightening at the mast instead, as a single group of lines cemented together? 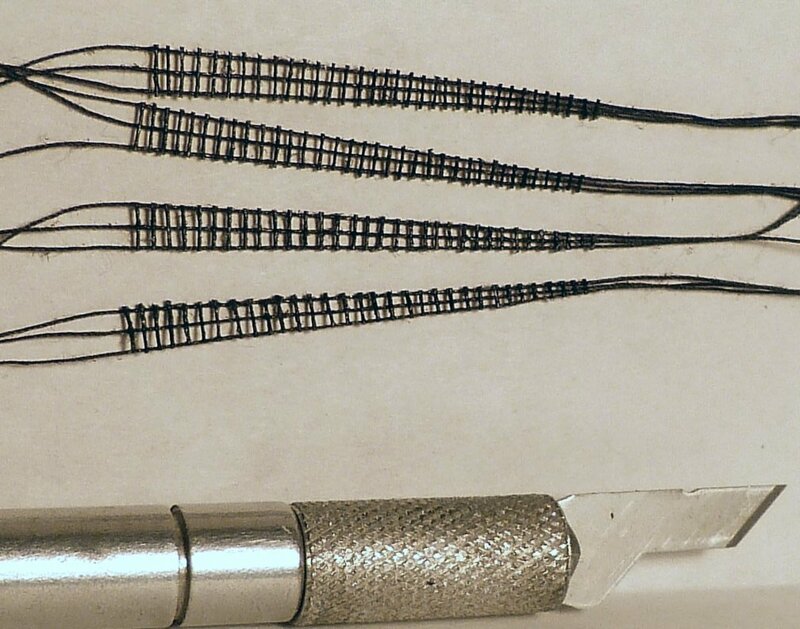 Have them attach at a single wire that goes through the mast with a loop on each end for each opposing shroud per mast. 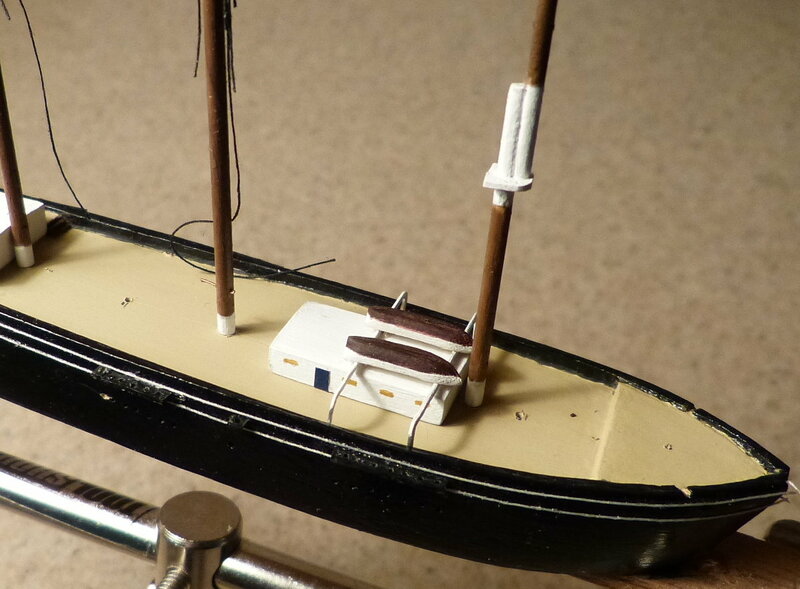 It would avoid drilling a weakening hole in the mast and involve only pulling on one "thread" to tighten. Of course, careful measurements outside of the bottle is to be done. What kind of wood you use for making the masts and yards? 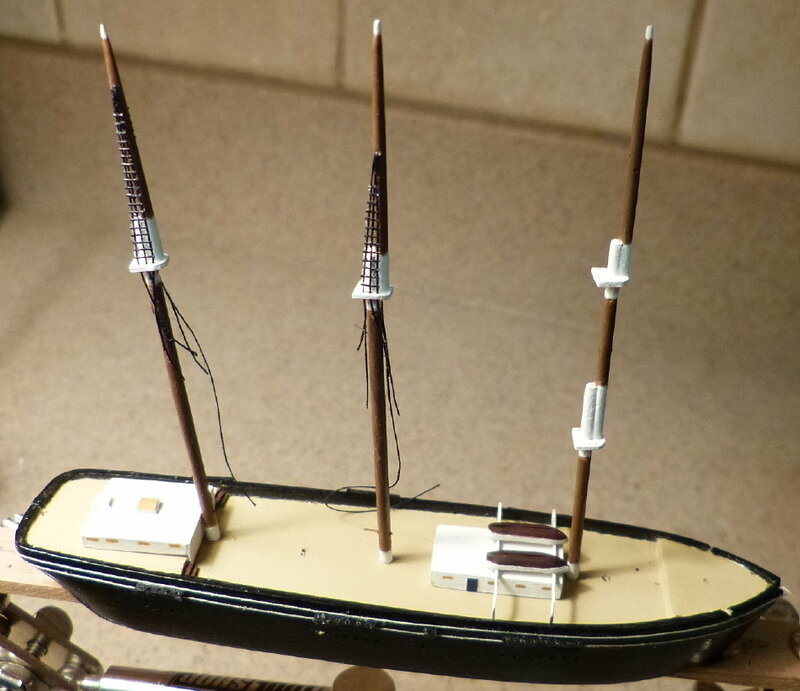 I wish I knew myself what species of wood I used in the masts and spars because need more! It doesn't act like pine because it very workable at the 2 mm diameter foremast. It doesn't have a grain, sands without any fuzziness, and drills cleanly. And BR to you, too! You can try to use bamboo for making the masts,yards and bowsprits. I appreciate the kind remarks, everyone! I’m adding a photo of three channels (new term for me!) that I made out of plastic. They are 2 mm wide and not glued in yet. Used plastic so I could carve a peg for a solid connection. 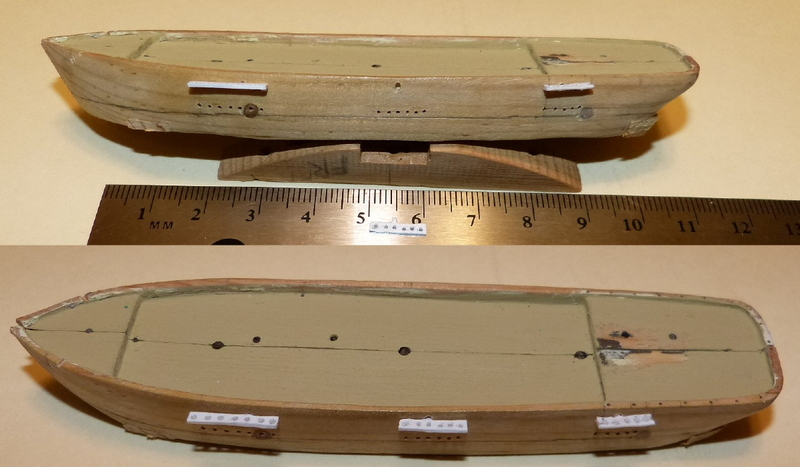 If you notice the group of holes in the hull at the mid and aft points, how the last ones on the right are up higher… a line drawing I’m referencing for this model depicts that. This thing looks like it’s been in a few battles and it’s only a merchant ship! I’m not going to use any type of putty for the sea for several reasons but here’s one. 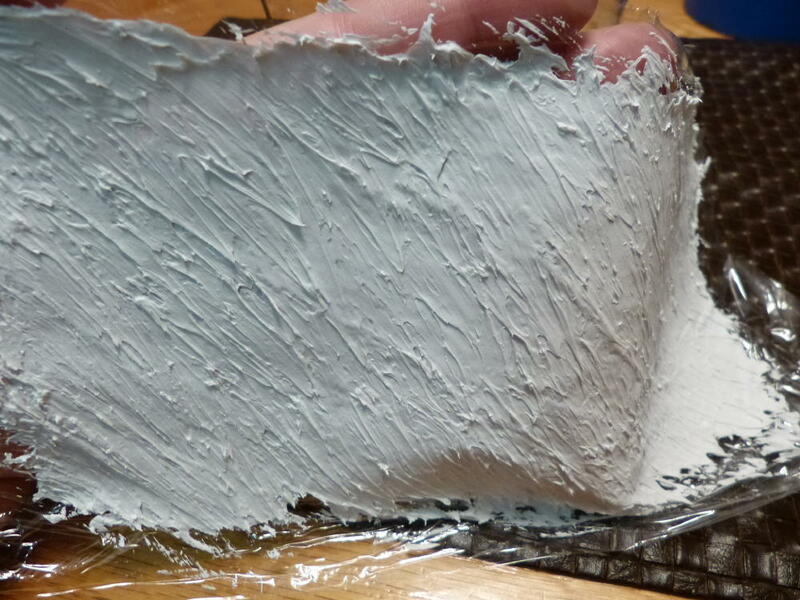 The oil-based non-hardening polymer clay would not have any gloss that would depict water and I couldn’t find any information about applying anything to make it glossy. My idea is to create the sea outside of the bottle and place it inside in two sections. This would be one of the last steps to do inside the bottle. 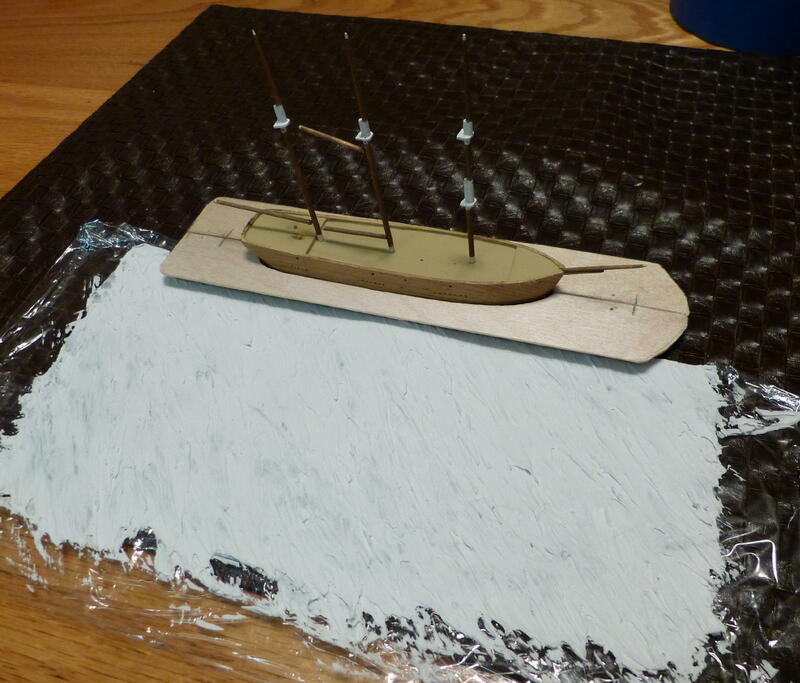 I applied paintable acrylic sealant to plastic wrap as a test to see if I could model waves. I like how it turned out; it’s to scale. 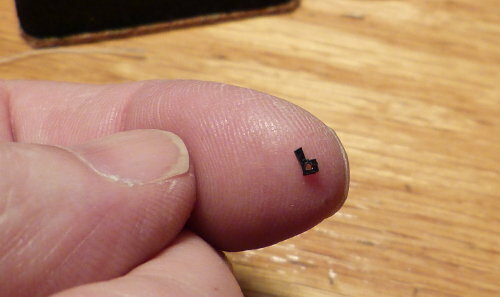 The thickness is only 1 to 2 mm. I’ll glue this sea to the wooden base, paint it, and divide the halves for the bottle insertion. I tested an adhesive for the plastic wrap and it’s good to go. The sea will only be 2 inches wide. We know how this goes… if it were wider, the sea would have risen and so would the ship. With this project right now, the tallest mast will only have 3/16” clearance when completed. Sizing things up; nothing glued down, of course. The camera brings out the imperfections that my glasses deny. While applying the black paint against the deck color the words "the enemy of good is better" kept going through my mind. Added a detail to the hull. Used diluted glue to attach the thread and coated it with clear sealer. At least another coat will go on when it comes time to do the complete hull. Very handsome bark, good to see someone's finally getting around to bottling her. Looks like a great start. One set of two of this length completed. Going to try epoxy for the initial tackiness factor instead of water-based glue. Here's some further progress. 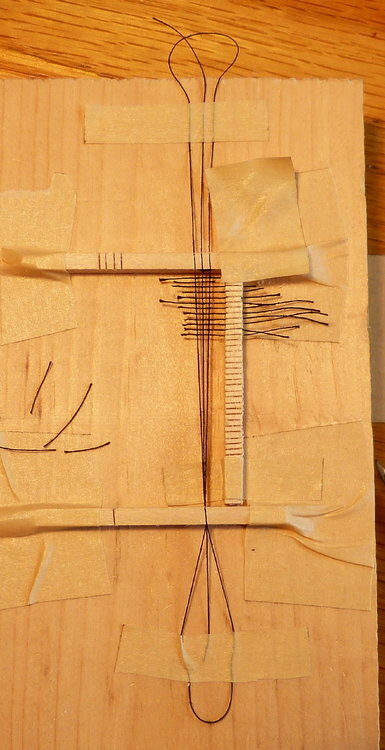 Epoxy was used only on the bottom one of the set here and only on one end of the short threads. Epoxy, being plastic, flares when cut. I'm going to continue with the diluted glue because it looks "cleaner". Changed comment about the adhesive. Very Impressive. Especially those detailed shrouds and rat lines. I'm going to copy your technique. 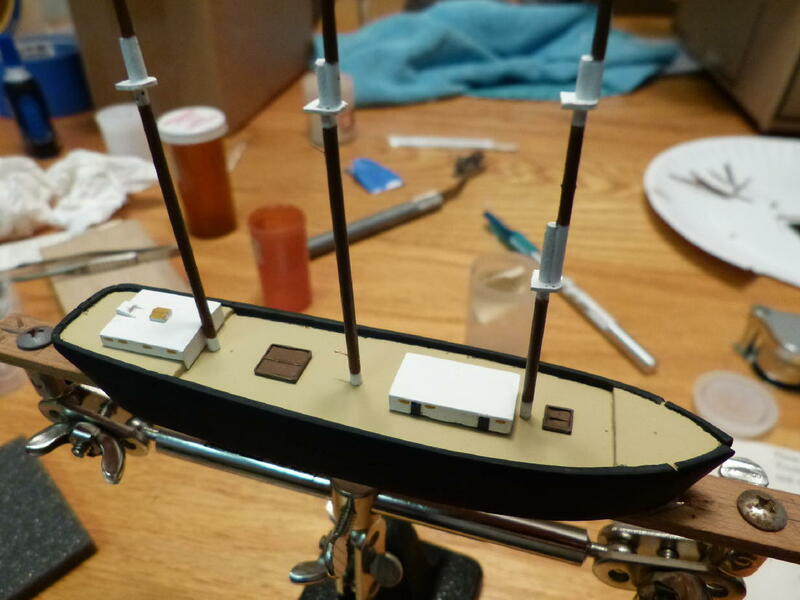 Continuing with the Dimond, I’ve added top shrouds on two masts and the forward cabin is complete. The cabin and lifeboats is a single assembly with an overall length of 22 mm. Those shrouds worked out nicely.